It’s almost September and I haven’t filed on therockmom in over two months! What have I been doing? What have I been listening to? Well, aside from entertaining the girls these eight weeks of school holiday, I’ve mainly been paralyzed with fear at the prospect of Rick Perry becoming the next President of the U.S.
Don’t laugh! And don’t underestimate this guy. He’s currently the longest continuously-serving governor around (of my home state, Texas). He can boast, fairly legitimately, of state job growth and low taxes. He’s never lost an election, going 10 for 10 since the mid-‘80s, and he has great hair. That's a 10-4 good buddy on my scorched earth policy and the benefits of Aqua Net. But he’s no powder-puff. If you don’t believe me, then take a look at ‘Dear Yankee’, by Paul Burka. That’ll clear things up for you. So in the midst of all of this Perry-Bachmann anti-evolution, anti-climate change, anti-intellectual regression, thank God I’ve got another West Texas son to lift my spirits. “Rave On” is the new Buddy Holly tribute album, and what a comfort it has been. Released this year in honor of what would be Holly’s 75th birthday (September 9), it’s chock full of Holly songs covered by some of my favorite musicians: Cee Lo Green, Fiona Apple (where have you been? ), The Black Keys, My Morning Jacket, etc. The album is a mixture of traditional and revisionist takes on Holly’s work. On the traditional side, Fiona Apple’s sweet duet with Jon Brion on ‘Everyday’, Karen Elson’s modest ‘Crying, Waiting, Hoping’ (is she singing about her ex, Jack White?) and She & Him’s (aka Zooey Deschanel & M. Ward) ‘All My Loving’ sound like you’re sitting in a malt shop in your poodle skirt and letter sweater. On the revisionist side, I can totally do without Lou Reed’s grungy, feedback-heavy ‘Peggy Sue’. Man, this guy could bring down a Doris Day song! To that weirdness I’d also add Paul McCartney’s version of ‘It’s So Easy’, which sounds promising enough but then deteriorates in the last 20 seconds as McCartney blabbers on free form about a juke joint or some such nonsense. He’s so square. Amidst the senior citizen rockers (John Doe, Graham Nash, Patti Smith) and hipster representatives (Modest Mouse, The Detroit Cobras, Julian Casablancas), the biggest surprise on the album – prepare yourself for this – is Kid Rock. With hand claps and horns, his version of ‘Well All Right’ strikes a groovy balance between ‘50s soul and meat-and-potatoes rock. Just like what John Mellancamp used to do. 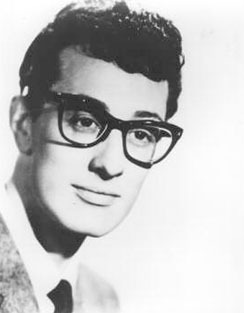 Buddy Holly grew up in Lubbock, Texas – about a three-hour drive from Rick Perry’s hometown of Paint Creek. If you know West Texas, a three-hour drive means they were practically neighbors. When I was in college, my Mom and stepdad lived in a little town southeast of Lubbock called Sweetwater. I’d drive five hours up from Austin on weekends to visit, and from about the town of Brownwood I’d play a game where I’d count how many miles I’d drive before I saw another car. 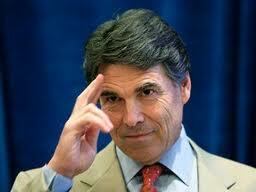 Unfortunately, Perry’s early isolation didn’t breed a thoughtful, introspective gentleman. He’s more the flip side to Buddy Holly’s tender meditation. While Holly wrote and sang about a romantic world of love and loss – all by the age of 22, mind you – Perry cut $4 billion from Texas public schools. I know it’s easy for me to look at the U.S. from afar, to read the NY Times online and pass judgment on a whole group of people who don’t believe that dinosaurs existed, or that greenhouse gases are bad for the planet. But, you know, at some point, Perry, Bachmann and those crazy junior Republican reps are going to have to accept that, for the next year or so, Obama is our President and they should just get on with building the healthiest, best-educated country they can – no matter what state you were born in, who your parents are, or what God you believe in. You’re a nut! Thanks for the comment – always great to hear from you! Yes, I have been MIA lately. But with kids back at school that means me back at the keyboard and enjoying the time to source cool music, old and new. After reading Keith Richards’ book over the summer I went and filled in my Rolling Stones collection: Goat’s Head Soup and Beggar’s Banquet. Am starting to feel more Stones than Beatle.